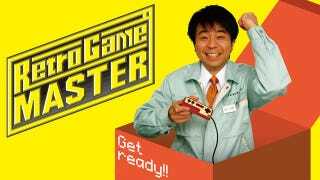 The U.S. premiere of Retro Game Master, the Japanese TV series that forces "middle management" comedian Shinya Arino to play Japan's most popular and difficult video games often in a single marathon session, hits Kotaku this week. The weekly series kicks off with an airing of a classic hour-long episode from season four of the show, originally known as Game Center CX, which pits the affable Arino against the original Ninja Gaiden. Released in Japan in 1988 on the Famicom to coincide with the release of an arcade game by the same name, Tecmo's Ninja Gaiden featured 20 levels spread over six acts and a final act that required beating three bosses without dying. In this episode of Retro Game Master, we watch Arino's marathon gaming session condensed to a one hour show. This first U.S. airing of the episode includes English captions for Arino and English dubbing for his off-camera announcer. The show goes live only on Kotaku at 8 p.m. eastern this Thursday and will be followed by a 11 more weekly episodes "airing" on Kotaku at the same time and day through September. And unlike with television, these episodes will stick around on our site so you can watch them at your own leisure. Game Center CX produced 15 seasons of gaming content in Japan, with Arino playing through dozens of Famicom, Super Famicom, PC Engine and Mega Drive games. The show also spawned two original games, one of which, Retro Game Challenge for the Nintendo DS, came to North America.